Remember a little over a month ago when I made my first stuffed pretzels? I said then that I was already dreaming up new ideas. 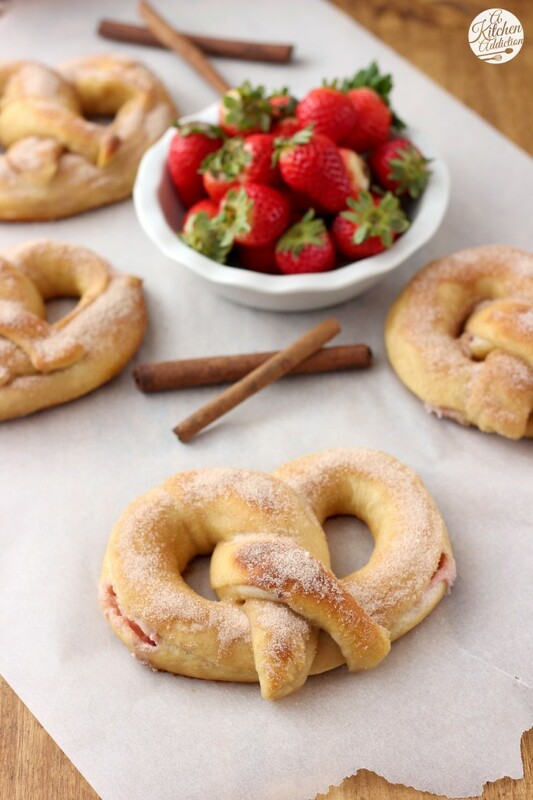 Well, these strawberry cream stuffed cinnamon sugar pretzels were at the top of my list of ideas, and I’m so glad that I’m finally sharing them with you! 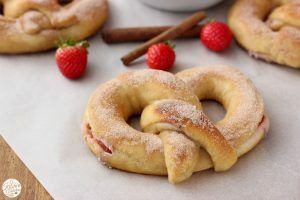 A simple filling of cream cheese, fresh strawberries, and confectioner’s sugar is stuffed inside of these soft, chewy pretzels. As soon as they are pulled out of the oven, they are then brushed with melted butter and generously sprinkled with cinnamon sugar. 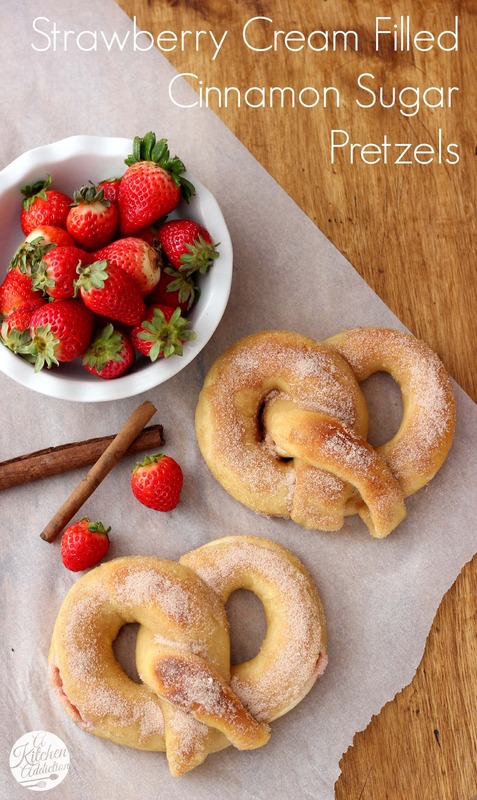 The next step is to bite into a warm, buttery, cinnamon sugary, sweet strawberry filled pretzel! The most difficult part of these pretzels is having to wait for them to finish baking, and then, when they are done, not eating the whole batch! In the bowl of a stand mixer, combine 3 cups flour, yeast, sugar, and salt. Add in water and butter. With mixer on low, slowly add another 1½ cups flour. If mixture is still too wet, add up to another additional ½ cup flour. Beat with paddle until dough starts to form. Switch out paddle attachment for dough hook and knead dough on medium speed for 5-7 minutes or until dough is smooth and pulls away from the edges of the bowl. Shape dough into a ball and place in a large bowl that has been sprayed with olive oil or non-stick cooking spray. Roll dough in the bottom to coat all sides. Cover and let rise in a warm place for an hour, or until doubled in size. Sift together confectioner's sugar and cornstarch. Slowly beat in cream cheese and strawberries until strawberries break down. Preheat oven to 425. Line a baking sheet with a baking mat or parchment paper. Turn dough out onto a lightly floured surface. Divide into 8 equal pieces. Roll each piece of dough out into roughly a 20x3 inch rectangle. Spread about a heaping tablespoon full of filling along the bottom of each rectangle.Carefully roll dough up lengthwise into a rope, making sure to pinch the ends tightly to prevent filling spilling out. Gently roll the dough out an inch or two longer. Shape into a pretzel and press ends down. Gently place pretzels one by one into the boiling water. Allow to boil for 25 seconds per side. Place on prepared baking sheet. Bake for 12-15 minutes or until pretzels turn golden brown. Remove from oven and brush warm pretzels with melted butter. Stir together sugar and cinnamon and generously sprinkle pretzels with cinnamon sugar. I need a stuffed pretzel to stuff in my face! These are so neat!! Oh my gosh these pretzels! I love homemade pretzels to begin with but stuffed with strawberry cream??? And a cinnamon sugar topping… awesome recipe! Pretty sure I will be craving these pretzels the rest of the day. I love a good pretzel and I love this filling. I saw your instagram post and have been wondering what you were cooking up!! These look ah-mazing. I want stuffed pretzels now!!! This is such a fun twist to an awesome thing!!! These just scream spring to me! YUM. Oh boy this for sure sounds terrific. Stuffed pretzels? Yes please! These sounds amazing, never seen a stuffed pretzel. Genius. Pretzels are such a guilty pleasure especially the ones from Auntie Annie’s at the mall, which these remind me of 😉 want to make right now!! Thank you! You are on a roll with the strawberries, and I’m lovin’ it. These look amazing. Pinned. Dessert pretzels! I love it. Totally in love with this concept. I adore soft pretzels, and these are some of the most creative I’ve ever seen! ohmy! I’ve been on a stuffed pretzel kick! I just made some yesterday actually! These sound incredible! Dessert pretzels! ooh I love it so much! These look so awesome!! My kids would love these pretzels. Oh my goodness I’m in love! These have my name written all over them! I can only imagine the combo of the soft chewy pretzels filled with strawberry cream cheese filling! Delicious! Pinning for later! These pretzels looks so pretty as we remeber them from Germany! What a delcious idea to stuff them with strawberry cream. What a great idea. Love this. WOW, wow, wow. 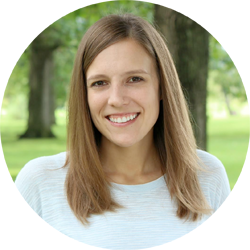 Crazy good idea, Jessica – I need to try these! Wow – these could not look any more perfect. Love this combination! There is no way I could show any self-control around these. So good! Wow these look so delicious!! I don’t know how I missed these, but I’m pretty sure I will never forget them! I love soft pretzels to begin with and you took them to a whole new level of amazing! They look and sound like pure bliss! Those are perfection! I was surprised at how well they turned out, but then when I took a bite….let’s just say it was VERY difficult to share I will make these again, but probably try a blueberry cream next time. Which, because they were so good, might be tomorrow. I’m so glad you liked them! Love the idea of using a blueberry cream! Wow, these look great! Who would say no to a stuffed pretzel… especially one with this yummy filling. Your pretzels always make me want to jump in the kitchen and pull out the yeast. Love this spring time flavor. I can only imagine how soft and flavorful these are! Can’t wait to try them. They look amazing!